My trike arrived yesterday and I am the envy of many in my senior apartment complex. At age 73, I was able to assemble by myself, with an 85 year old female to hold a wrench in the one step that requires 2 people. There is an excellent video on youtube, but I needed the written instructions to use all the provided washers. It was hard to get the handgrips on, but my female apartment manager was able to complete what I had started. After riding inside for awhile, some elements were out of alignment. My son-in-law stopped by after work and tightened all the bolts. He also rode down the hall and back. I am so glad I chose this model! It has few parts to wear out and is sturdily made. Most important for elevator and apartment exit, it can be pedaled backwards which a chain driven trike cannot. Was impress on how quickly it came, arrived on my Birthday. The assembly was easy to follow, plenty of information and videos to watch and then put together. It whent together fairly well for me. Been working on bicycles for years. Rides good on level surfaces, and goes really quick on the downhills, and to control with the peddles. The only downside was some one forgot to put one of the valve caps on. So just a little part was missing. Hope Workman Cycle will send me a Newspaper Boys Bike for writing up this great review. Am disabled and use the adult sized tricycle for strengthing my legs. Have fun, it is build good and heavy duty...and I am well satisifed. We absolutely love the Worksman WTX Wide Track Trike we bought for our son. He is a severely autistic 11-year-old, teaching him to ride a two-wheeler is difficult, and he's way too big for training wheels. His school, the Bluegrass Center for Autism, has one of the trikes, which was where we discovered them. 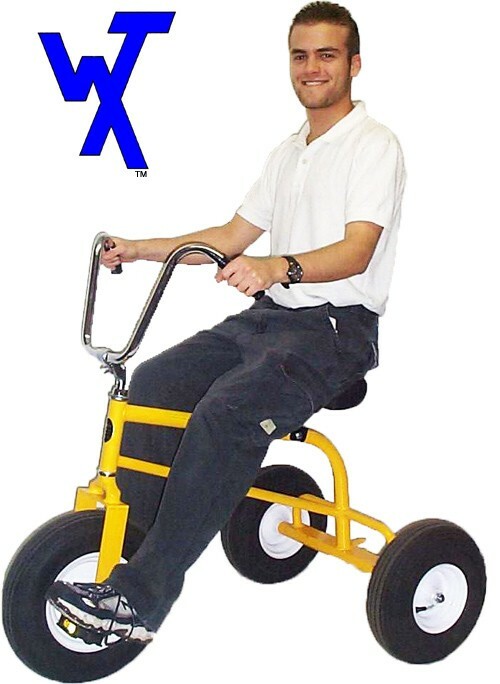 The WTX is the only adult size tricycle we know of, and it is amazingly solid and well manufactured. The perfect solution to getting him riding and exercising. And the folks at Worksman are WONDERFUL to work with. A really high quality product that we will likely be using for years to come. Thank you so much, Worksman! Simplicity is a beautiful thing, and with this bike, that is exactly what you are getting. THIS is the way we all learned to ride... on a direct drive trike. Pedal forward. Pedal backward. Stopping is as intuitive as simply not pedaling. This is the ideal solution for kids and "big kids" alike who need a simple and sturdy vehicle, who may not have the ability to operate a traditional two, or even three wheeler. Price is right too! This is a great bike for my autistic granddaughter, age 13. The handle bars are a bit awkward for her, but she seems to be learning how to use them. The large wheels are perfect for the area she rides in. We have a friend who owns a bike shop and he put it together in about 20 minutes...no help needed. I would highly recommend this bike. Very sturdy and well built. My 6' boy friend was able to ride this as well as me and I'm 5'4. My son is in between. A great alternative to the adult tricycles with speeds and hand brakes. I have no doubt my son will use this for many many years to come. My wife and I rented four WTX Wide Track Adult Trikes from a local outdoor recreation company and used them to have a high-action, low-octane, mounted water balloon and squirt gun fight with our neighbors. We had not had nearly that much fun in ages! When is the delivery? I haven't received the products I ordered three tri-bike. It's taking too long to get them? May I have an honest prompt response?